It would appear that Knightwood Estates in Central Road has shut up shop and are no longer answering the phones, according to a commenter on this blog. This has also been backed up by The Brinkster (who is not to be confused with myself). And if The Brinkster says it's true then who am I to argue - after all he lives on a privileged gated development etc.etc. It certainly seems that this is the case, with the blinds down and what seems like several days' post lying unopened at the doorway. The comment came from a landlord doing battle with Knightwood Estates - sadly not the first comment on this blog from a less than satisfied customer. 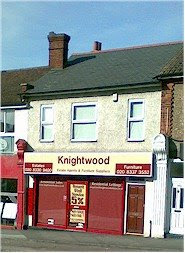 There are other postings relating to Knightwood's service to be found on the web. Has this bizarre 'estate agency meets furniture company' met a not altogether undeserving sticky end? If you do have any more information, do let me know. Or tell The Brinkster. To be honest, even I get confused as to who I am.